Scholastic Titles provide a powerful incentive for improvement. The criteria for awarding titles are tough enough to command respect, but not so difficult as to be viewed as insurmountable. For the lowest titles, simple over-the-board performance determine whether a player should be promoted. For higher levels, the criteria are more difficult. Most titles require 1st place finishes in events (sections) of appropriate significance as measured by our proprietary SSI (Section Significance Index). 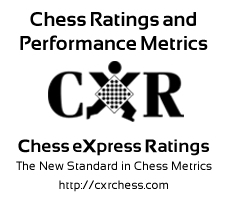 Because some affiliates do not run frequent CXR-rated tournaments, we provide an alternative requirement, Criterion 6 (defeating a significant number of stronger opponents). * Note: Tying for 1st place will be acceptable, provided that the number of 1st place finishers is less than 34% of the effective number of players in the section (e.g. 2 people tying for first in a 6-player section is okay, but not okay in a 5-player section). ** Number of unique stronger opponents beaten since last promotion. If this target is met, criterion 3 is waived. Each affiliate decides whether to participate in the Scholastic Titles program or not. For participating affiliates, titles are displayed on the player’s Achievements page. Every player is evaluated once per month, to determine whether a promotion in title has been earned.